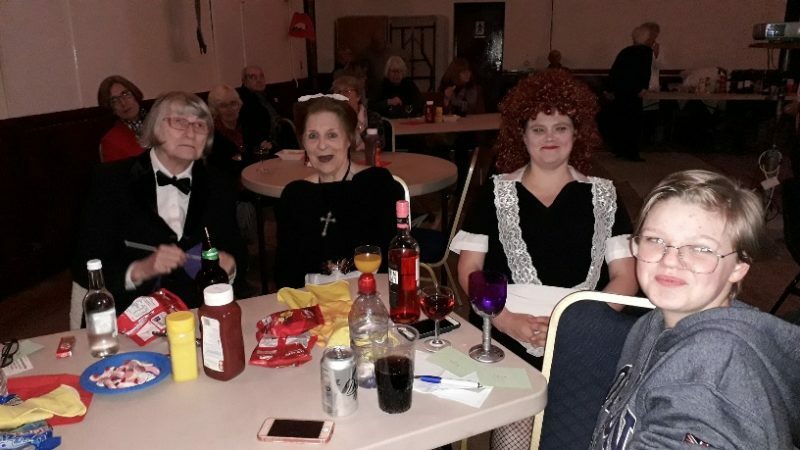 The Rocky Horror Picture Show came to town last Friday, March 29, Held at Rye Community Centre, Conduit Hill, this was a sing-along version with the audience encouraged to dress in character. The doors and bar opened at 7pm and the audience arrived. Many dressed up, including the staff. There were Magentas, Columbias, Frank-N-Furters and transvestites throughout the audience. The event was hosted by the Rye Players as a chance for the local community to show their fun, and expressive side. The night was dress to impress with a prize for the best costume. As the original film was played and the story progressed the audience sang and a few actually got up and danced, encouraging more to do so. When the song “time warp” came on the screen all stood up from their tables and danced to the actions and dance on the screen. Half way through, there was an interval when supper was provided as part of the entry fee (£10). This was a Frankfurter hotdog (linked to a main character) with nibbles on tables. Dessert was then served, this was a Black Forest gateau which was a nod towards the location of the action in the film. Both meal and dessert had vegan options if needed. As the movie came to the end the raffle and costume prizes were awarded. First place was Liza Arcadia, dressed as Magenta with a prize of a box of Matchmaker chocolates. This night was enjoyed by all and gave a chance for Ryers to let their hair down, dress outrageously and have fun.